Stimple & Ward Company enjoys an industry wide reputation as America¹s most highly respected manufacturer of DC motor coil products. 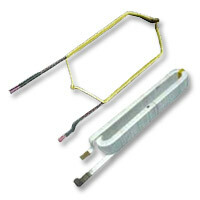 We manufacture DC motor and generator coils for heavy industrial, mining, and transportation applications. Our specialized methods and custom machines allow us to manufacture DC motor coils that are second to none. Some of our unique assets include edge winding equipment, annealing furnaces, automated winding equipment and hundreds of coil forming fixtures for common motors. Located in Pittsburgh, Pennsylvania, the heart of steel country through much of the 1980's, we have serviced the majority of U.S. Steel mills throughout our history. Due to these close ties with the steel industry, a prime user of DC equipment, we have amassed a tremendous amount of data and tooling for the manufacture of mill motor and heavy industrial motor coils. If you're looking for coils for Westinghouse "MC", General Electric "MD", Elliott "W" type motors, or EMD Locomotive auxiliary motor/generator coils, there is a good chance we have the coil you need on the shelf! Each coil is hand-crafted with attention to the finest details and precisely formed to final dimensions based on over 100 years of experience, accumulated winding data, patterns, & tooling. We manufacture all types of field coils for DC motors & generators, from 1 HP to 30,000 HP, and weighing 1 lb. to 2000 lbs. Shunt, Series, Stabilized Shunt, or Compound Wound. If you would like more information on DC motor coil products please call 1-800-792-6457 or click here to contact us.